Apple promises battery improvements in the iPhone 7 Plus, claiming it will give you an additional hour of life over the iPhone 6S Plus. That's not as good as the extra two hours claimed for the iPhone 7 over the iPhone 6S, but the smaller handset wasn't as good with its battery as the Plus to start with, so we can forgive the more modest improvement here; hell, it's not always guaranteed that battery life will improve significantly from one generation to the next, so at least we're off to a positive start. While Apple never reveals the battery capacities of its phones, users have been digging around feverishly, and it looks like the iPhone 7 Plus has a 2,900mAh power pack. That would be up from the 2,750mAh offering in the 6S Plus, so perhaps the removal of the headphone port has freed up a bit of space inside – every cloud, eh? It's not just an increase in battery size which Apple reckons will see the 7 Plus last longer – it's also the new A10 Fusion chip, which has two low-power and two high-power cores. The lower-power cores handle basic tasks, such as web browsing and emails, while consuming less power, and the more powerful duo come into play when you fire-up a game or an HD movie. Whether that has a marked effect on the battery isn't that clear, but we can report that the battery life on the iPhone 7 Plus is very good. It'll happily last a full day on a single charge with relatively heavy usage, including over an hour of gaming, a couple of hours of Spotify streaming, and regular social media and email action, as well as a fair amount of camera time. That's in line with the Android flagship competition, with a full day's use the benchmark for battery performance now. With lighter usage we were able to get to bedtime with around 30% still left in the tank, and overnight drain saw only a 4% drop-off, meaning we could at least get to our desk the next morning before needing a charge. During our review time with the iPhone 7 Plus we didn't see any really noticeable gains in battery performance over its predecessor, but those looking to upgrade from the iPhone 6 Plus (or any older iPhone) will be pleased to know the new iPhone phablet is comfortably better in this department. 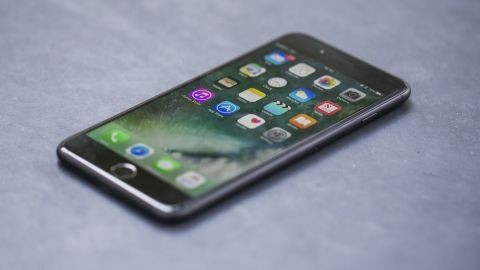 You will, more than likely, end up charging the iPhone 7 Plus every night, as it certainly won't see out two days between plug-ins – and top-ups aren't overly quick, with no sign of the fast-charging tech we've enjoyed in many other phones. If you do find yourself running low, iOS retains the low-power mode which Apple introduced with iOS 9, helping you get the most out of the last dregs of your charge. Drop below 20% and the 7 Plus will prompt you to switch on the power-saving mode – but you can manually control this from the settings menu too.